Although it is a fairly basic toy, Matchbox cars never failed to entertain my father. These toy cars allowed my father to mimic his own father, while teaching responsibility, independence and how to be well-behaved. Growing up without a backyard, Matchbox cars were a way for my father to express himself and exercise his imagine within the confines of his urban apartment. They were heavily advertised toys, making children believe that if they didn’t have Matchbox cars, they were not cool, and thus creating a huge market. 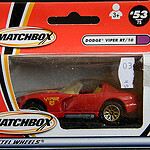 Working in conjunction with Hotwheels cars, Matchbox branched out to create various accessory toys to complement the toy cars, such as racetracks, travel case and more. While the exact design of Matchbox cars has certainly changed over the years, they are still played with and sold today, and are a perfect example of how toys bridge the gap between generations. This work by plobue is licensed under a Creative Commons Attribution 4.0 International License.